The weather was the least of Kimi Raikkonen's problems when his cars front end was in bits. 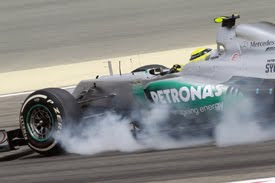 The returning 2007 world champion was taking the chance of poor weather conditions to change the power of his power steering. 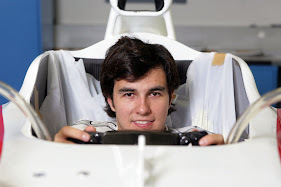 Which according to sources he has not been happy with so far in the Lotus. The weather didn't stop the teams and the first car on track was the Toro Rosso of Jean-Eric Vergne. The rookie Frenchman was quickly followed by the the pack and they all ran through installation laps to make sure the car was working ready to go push on a fast lap. 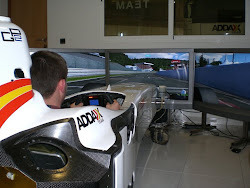 Although this early section of the practice sessions are not thrilling for the spectators it is crucial work for the team to confirm the car is fundamentally ready to run. Slowly by slowly the teams moved out back onto the circuit on the green marked intermediate Pirelli tyres. The times kept tumbling due to the ever drying track and ever growing confident drivers. All the teams were out on track as although wet conditions are not ideal, being the beginning of the season they still need to do aero and this is possible in damp conditions. 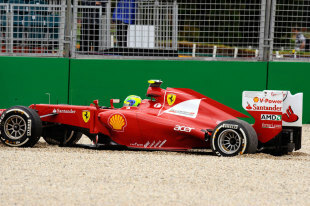 The times were improving every lap and whilst Felipe Massa had just completed his fastest 1st sector the Brazilian spun at turn 9 after getting his rear tyre onto the grass whilst under breaking. This left the Ferrari driver 18th after the 90minutes of practice and feeling rather embarrassed. The weather forecast predicted for Friday practice 2 (FP2) was meant to be dry but just minutes before the green light the heavens opened. This drenched the track and meant a very slow start to the second session with very few cars heading out. When the cars did emerge from the garages they were all on the blue marked full wet tyres as there was clearly a lot of standing water left on the circuit. Like the first session the teams had to do the standard procedure of installation laps to confirm the car is ready and a chance for the driver to find how the track is feeling on grip. The quiet spell on the track due to the weather allowed the newly designed HRT team to get some valuable mileage under the belt for Indian driver Karthikeyan. The HRT team had issues with Narain Karthikeyan's car who stopped in FP1 reportedly due to a drop in oil pressure. Similarly to the 1st session the track dried out over the period of the first 60minutes whilst the grid ran intermediate tyres. This left the last section of the 90minutes for the teams to attack the track with some dry running. Everyone was on track to get some crucial data of dry running going into the weekend. 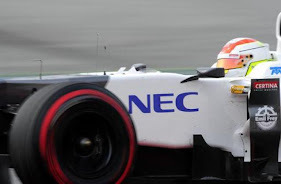 Interestingly unlike FP1 teams decided to allow there drivers to run on the yellow mark soft compound. This tyre is meant to be quicker but the white marked hard compound was delivering the fastest times in this session. 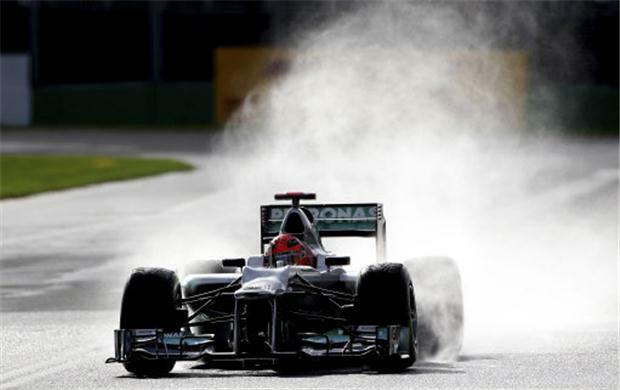 This may be due to the tyre compound being able to reach operating temperature at a lower figure. The times were getting quicker and quicker with both Sahara Force India's looking impressive but the P1 posistion went to 7 time world champion Michael Schumacher driving for this years dark horse Mercedes. Shockingly despite looking twitchy the prancing horse of Ferrari picked up another 4th from Fernando and a positive 7th from Felipe Massa. What was your view of the first two practice sessions? Let me know via a comment on this blog or Tweet me via the link below.